Congratulations to the winners of our Free Play Days Sweepstakes! 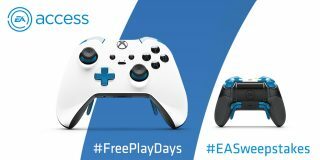 EA Access Free Play Days* are here, and to celebrate, we're offering the EA Access Free Play Days Sweepstakes and giving away a special EA Access-themed Xbox One and three Elite controllers! All you have to do is tweet @EAAccess with your favorite screenshot from the EA Access Vault and the hashtags #EASweepstakes and #FreePlayDays between Sunday, June 12, 12PM Pacific and Wednesday, June 22, 11:59PM Pacific. 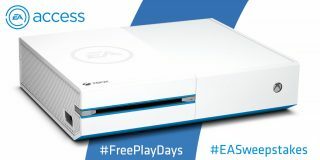 Winners will be announced after EA Access Free Play Days! See Official Rules below. To learn more about EA Access, including the full lineup of Vault games, head over to the EA Access Membership page. 1. Entry. To enter the EA Access Free Play Days Sweepstakes (the “Sweepstakes”), tweet @ EAAccess with a screenshot from your favorite EA Access Vault game including #EASweepstakes and #freeplaydays (collectively, the “Entry” or “Entries”) between12 p.m. PST on June 12, 2016 and 11:59 p.m. PST on June 22, 2016 (the “Sweepstakes Period”). No other methods of entry will be accepted. Completed Entries must be received by 11:59 p.m. PST on June 22, 2016. Entries become the property of Sponsor and will not be returned. Sponsor assumes no responsibility for lost, late, incomplete, incorrect, or misdirected entries. Use of a false email account will disqualify an Entry. Sponsor is not responsible for technical, hardware or software malfunctions, misdirected Entries, lost or unavailable network connections, or failed, incorrect, inaccurate, incomplete, lost, late, illegible, misdirected, garbled, damaged or delayed electronic or other communications or other technical problems related to website Entries. Sponsor, in its sole discretion, reserves the right to disqualify any person who tampers with the Entry process or the operation of the web site, or who otherwise violates these rules. By entering, Entrants accept and agree to abide by the terms of these Official Rules. Limit: Only one Entry per username and email address will be accepted. 2. Eligibility. This Sweepstakes is only open to residents of the 50 United States and the District of Columbia, and Canada (except Quebec) who are 18 years of age or older at time Sweepstakes begins and who had Internet access as of June 10, 2016. Employees of EA and its respective affiliates, subsidiaries, representatives, advertising, promotion and publicity agencies (“Sponsor and its Agents”) and the immediate family members and persons living in the same household of each are not eligible. Sweepstakes is void where prohibited, restricted or taxed by law. All federal, state and local laws and regulations apply. 3. Prizes; Winner Selection and Notification. There are four (4) prizes. Odds of winning any prize depend upon the number of eligible Entries in the Sweepstakes. First Prize: One Winner will receive an EA Access-themed Xbox One console. Approximate retail value (“ARV”) is $300. Second Prize: Three winners will each receive an Xbox One Elite Controller. ARV of each prize is $150. Prizes are not transferable. No substitution of prizes for cash or other goods and services is permitted, except Sponsor reserves the right to provide a substitute prize of approximately equal value. Console and controller make/model to be awarded as prizes are within the sole discretion of Sponsor and subject to availability. All expenses not specified above, including, without limitation, all federal, state and local taxes, and international tariffs, are the sole responsibility of the individual winners. Potential winners will be determined by random drawing on or about June 24, 2016 from all eligible Entries received. The drawing will be conducted at Sponsor’s address as indicated at the beginning of these rules by Sponsor or its designee, the judge of the Sweepstakes, whose decisions are final and binding. Potential winners may be required to complete and sign a Declaration of Eligibility and, except where prohibited, Liability/Publicity Release, in the form provided by Sponsor, within 14 days of attempted notification in order to claim prize. Canadian winners must also answer a skill-based question in order to claim prize. Potential winners will be notified on or about June 27, 2016 by a DM on Twitter. If a potential winner cannot be contacted, is contacted and does not respond as directed within 14 days of attempted notification, fails to sign and/or return the Declaration of Eligibility, refuses the prize, is ineligible to accept the prize, or prize is returned as undeliverable, the potential winner forfeits the prize. If a winner is 18 or older, as required, but a minor in his or her state, country or providence of residence, winner’s parent or legal guardian will be required to sign all necessary documents. Receiving a prize is contingent upon compliance with these Official Rules; all prizes claimed in accordance with these Official Rules will be awarded. In the event that a potential winner is disqualified or the prize is forfeited for any reason, Sponsor will award the applicable prize, time permitting given the nature of the prize, to an alternate winner by random drawing from all remaining eligible Entries. Only three (3) alternate drawings will be held, after which EA retains the discretion to donate the applicable prize to a charity of Sponsor choosing. Potential winners may be required to provide a shipping address to claim prize. Allow 4-6 weeks for delivery of prize. Except if Entrant is a resident of TN or otherwise where prohibited by law, Entrant agrees that Sponsor and/or its Agents, have the right to use the Entrant’s first and/or last name, user or screen name and hometown on Sponsor’s and/or Agents respective websites and in any and all media, including in connection with marketing and promotion of Sponsor’s products or services, without any further attribution, notification or compensation to Entrants. Sponsor shall have no obligation (express or implied) to use any of the Entries, including the winning Entries and Entrants shall not be entitled to any damages or other relief by reason of Sponsor’s use or non-use of any entry. 5. Winners list. 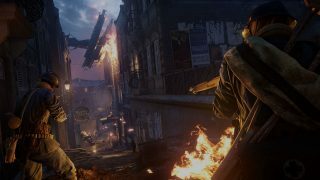 A winners list will be posted at http://www.ea.com/eaaccess/news/free-play-days-sweepstakes.html for two weeks after all winners are determined and verified.